So it's that time of year again, when the stores are full of red hearts and roses and theres 'love' signs everywhere you go. Which means it's the annual Jordan buys herself everything she wants..."Alexa, play I Don't Need A Man by The Pussycat Dolls". Now I'm not going to lie, I have no problem spending money on myself any day of the week but when Valentines comes round the past two years I've gone a little bit extra so I thought why not make it three years in a row!? Yes I've already ordered myself all my gifts but don't worry of course I'll be sharing them on the day because they're all cute af. So thanks to Ariana Grande's latest bop '7 Rings' I decided that I'm extra and instead of writing a Valentines Gift Guide like I have the past two years (which you can find here) this year I'd just write a Galentines gift ideas post and then when the 13th of February approaches I may aswell show you all what I spoiled myself with...because why not!? 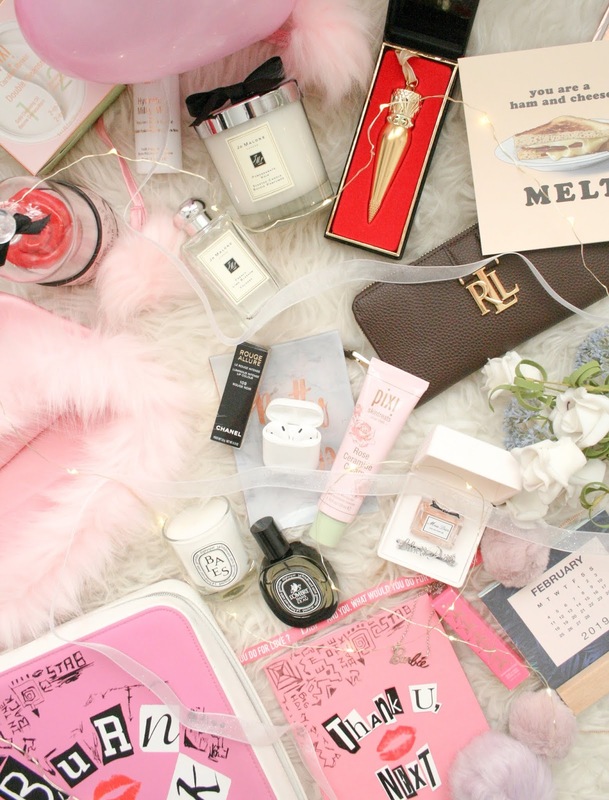 Who doesn't love a good 'oul What I Got For insert whatever the occasion here kinda blog post. So lets get into what you can possibly treat yo'self too because sis trust me you deserve it all! I'ma start off with something simple, so if you fancy having a chill pamper evening in why not grab some new skincare products you've been dying to try out? Or even just getting round to re-purchasing old favourites that you just haven't gotten around to doing. Personally at the mo I'm recommending the Pixi Double Cleanse, the Rose Ceramide Cream and the Pixi Milky Mist. I absolutely adore the products and use them on a regular basis since getting them. I wrote all about them in a post of their own which incase you missed out on you can have a lil read all about them here. If like me you have a slight little obsession when it comes to makeup then same fam! So I'm not talking your regular Smashbox lipstick I'm thinking bigger because we wanna be a little bit more than regular we're aiming for a lil extraness (not dragging smashbox bc love). So lets start off with maybe a little Chanel Rouge Allure lipstick I mean it's not too heavy on your bank account and is quite affordable for a luxury brand and everybody loves a lil Chanel in their life amiright?! So maybe Chanel just isn't doing it for you so if you wanna go up that one little step higher and are full on prepared to drop €85 euro on a single lipstick...girl get yourself a Christian Louboutin lipstick this is one of those beauty products I do not regret purchasing at all. Still to this day I am obsessed with everything about it, the packaging, the design, the formula everything is perf and I love it and 10000% recommend them. Like Ari said "happiness is the same price as red bottoms" but I can't afford them rn so the lipstick is the next best thing. Perfumes are always a good idea, yes I may already have 70 bottles but I want more. -That sounded very Veruca Salt of me- Know what is also another great thing to buy... Candles and not just any kind I'm talking the luxury you're actually paying that money on a candle kind of ones! So lets start with Diptyque, now I'm still very new to this brand as in these are the only scents I own kinda new but I love them so had to recommend them. The Diptyque L'ombre Dans L'eau fragrance is very different to the perfume scents I normally wear, it's much stronger and not as sweet as my usual picks but it still has a floral element to it. The matching Baies candle comes with the same scent and it fills your room with the scent in just moments when you burn the candle. You can get both in a set together or purchase separately. Another brand that you CANNOT go wrong with when it comes to fragrances and candles is good 'oul trusty Jo Malone. Ugh fave like. If you're to treat yourself to one fragrance go smell some Jo Malone because you're bound to fall in love with at least three scents. I absolutely adore the Peony & Blush Suede scent aswell as the Fresh Lime & Blossom and the ever so famous Pomegranate Noir. These perfumes last on you for absolutely hours and the candles are on another level. You can literally light one of these candles for five minutes and then pop the lid back on it and I can guarantee you that you will still smell the scent lingering through your house four hours later. When an occasion pops around I like to buy myself one lil 'extra' kinda gift as in it's in the €100+ price range (I mean that's what credit cards are for right kids....dont get a credit card!) Usually it's either an Apple product (they literally own me, like they may aswell just do a direct debit from my account when they release a new product) or a new designer handbag... I mean go big or go home right? Something that I honestly cannot live without are my AirPods I honestly think they're worth every penny and if like me you've absolutely no time for wires these are for you fam. Last year I decided to pick myself up my first Valentino handbag because every girl needs some Valentino in her life. (See Insta post here to see what I bought myself last year) So yeah maybe you've had your eye on a bag or a purse and you just haven't bought it yet for yourself...what are you waiting for girly? Click that 'add to basket' button. Or if you're not feeling like spending an extreme amount of money nothing beats a new pair of pyjamas and your favourite movie! Will you be treating yourself for Galentines? These are all really lovely!